Mallorca is a beautiful holiday island in the Mediterranean Sea, about 170 km off the coast of mainland Spain. It belongs to a group of islands called the Balearic islands, which also includes the islands of Menorca, Ibiza and Formentera. The largest city of Mallorca is Palma de Mallorca which is also the capital of the Balearic Islands. 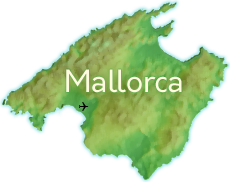 This website is a complete holiday guide to Mallorca, which provides all the information needed to plan and book your holiday to Mallorca including Palma de Mallorca guide, photos, resort guides, Mallorca beaches, Holiday Homes, Mallorca map, Mallorca hotels and much more. Welcome! Mallorcatour.net is now mobile phones & devices friendly so you can use it as a handy guide while exploring the island. You can find more special holiday offers in the "Hotels & special offers" section and in the Resort Guide pages for all the top resorts in Mallorca.